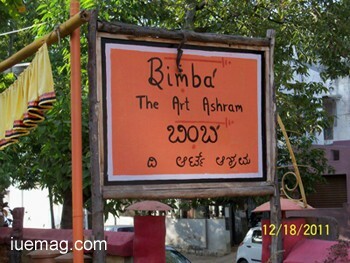 A cultural hub, Bimba is a temple of art. With the creator working in the same compound and being so very involved in the store, it surely is an island brimming with talent. The store is welcoming and allows a visitor to build an intimate relationship with the place and the people. They house a diverse set of items, which are never produced in a uniform manner. Depending on the creator's mood and inspiration, each piece varies from the other, allowing no repetition. They have items ranging from itsy-bitsy drawer knobs to very grand wooden stools and shelves, which are inspired by colors and designs from the Indian flora and fauna. Every piece in their store near Nagsandra Circle, Basavanagudi, has a history, making any purchase a meaningful one. With every piece varying from the other, you can definitely bag an exclusive creation here. 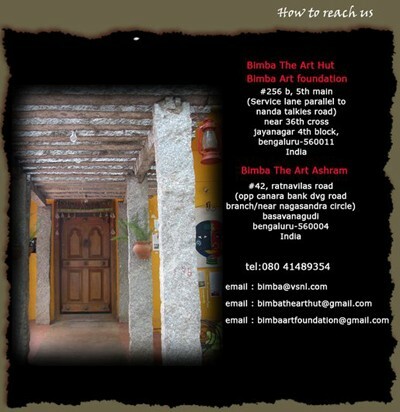 More about this unique place let us know from Mr. Deepak Dorai, Co-founder of Bimba Art Hut. How did you come up with the idea of 'Bimba'? There was no such major planning, it is something that came from the heart and art always comes from the heart. BIMBA in Sanskrit connotes Reflection. BIMBA mirrors the unique vision of an artist for growing art - its practice and sharing. It all started in Chennai and then in 2001 we shifted to Bangalore. We are not that much into preserving traditional art as conscious thought. Accidently, we found this place. We should preserve our architecture also. It is as important as preserving Tiger, isn't it? The founder Deepika altered it as a sharing and celebration of life itself. Art is always thought on the wall or a page, just to admire from distance. But she lives with the thought that the art is to be breathed, lived, shared and grown. It is more of celebrating life! Sir, is recycling the main idea of Bimba? We are not doing recycling. An artist's aim is to create a beautiful element, whether it is from new or old lying around us. Bimba's challenge lies in making people realize the difference between recycling and celebrating nature. The former is a "conscious effort" while the latter is "instinctive". Calling ourselves 'eco-friendly' gives it a superficial tone. How can you be 'friends' with your mother? She is an intrinsic part of you as you are of her. Why is Bimba denoted as 'Earth sensitve'? At Bimba, nature inspires. We respect - nay worship Earth and her gifts. Here we attempt to go beyond the "Eco-Friendly" cliché. We aim at zero waste while exploring art in various facets and scale of size including miniature to larger-than-life art. We work with earthy media. We work with handmade processes. We enjoy raw finishes. We connect spaces with their occupants in many ways. Each of these simple actions is by itself an energy saver while a perpetuating art. But this is only the tip of the iceberg. We continuously challenge myths that barrier the aesthetic and functional aspects or tradition and modernity. Art Lovers, art seekers, artisans and artists who walk in become friends for a lifetime. Art at Bimba also means sustenance by celebrating many of our local identities ("Ethnicities") and handmade beauty that stems from earthy Living. Why grow art? When we grow art, we grow ourselves - the beauty within us as well as in our surroundings and preserve and invent the best of societal and cultural practices. A commonly held belief is that growing art is beyond the non-artist and that art is elitist. Art doesn't engage with basic societal needs. The truth changes when we redefine for ourselves what art means to us. Sir, please tell me about the artist Deepika. The artist from childhood has stayed with art as a Bharatanatyam performer. She wanted to learn different types of art. For her art is Spiritual, the sharing of art with public is also spiritual. She believes in sharing art forms she know in its purity. We love in celebrating the art in its aesthetic way. So, she started this practice in Chennai in a very small way. We found a very old 1960's home around that time and she started working. She started experimenting with various earthly elements. Firstly, she started with fabric, then metal, later she started working with people who work on wood. So, her aim is not only to create art, but also the value related to that. For her it's not about selling her creativity as a product, her thought is who will take it home and remember the story of its creation. She says that anybody who comes to Bimba should feel the purity of art. I would compare artists to physically challenged people. An artist who has great knowledge is not supported in this world. As a result, he becomes a 'Socially challenged' person. "Passion denotes a certain amount of aggression; what art needs is compassion, a calm passion to reconnect with nature." If I am running after money, I am losing its originality. One cannot hold on to both money and passion. If he chooses passion he has to forgo money. If it has to come then it will come in many ways, we don't have to worry about money. Marketing should not destroy art; it should present the truth of art. In this world it is easy to champion something that is commercial. Sharing commercial information has become more important than sharing truth in today's world scenario. All people are facing challenges, so are we. Art is all about truth and it's challenging. What art needs now is voluntary work to preserve it. Why is that many people don't know the existence of this place? I get surprised when people tell that they know this people because we don't aim in spreading our existence and it is also costly to publicize ourselves. So, in the process of publishing ourselves we don't want to become commercial and lose the identity and purity of art we live for. I sometimes get scared of crowd also. Information sharing should be automatic and a voluntary process. Sir, can you please tell in few words, about the time you have spent with Bimba? It's magnificent! In the sense, my life has become meaningful. We meet lovely people every day which is very rewarding. We are working all the time in what we believe in, so whatever comes, we are chosen to do it. It has given us lots of memories for life and still it is. I will take this art and share it with the world in its own artistic atmosphere. I will not let go off it as a product, exhibition; we want the people to experience. This is a unique place where one can experience and live through the creation .This process is the best in the life of artists. For us, practitioners and followers of art, it has continually refined our life.